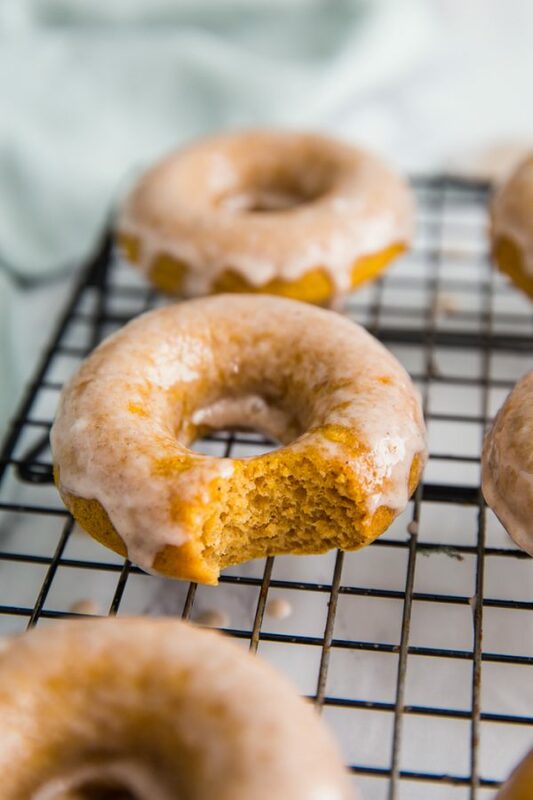 I mentioned on my Instagram recently that I’m planning a PUMPKIN WEEK on my blog that consists of a new pumpkin recipe every day for 6 (or maybe 7?) straight days. It’s gonna be GOOD! OH and it starts on October 15th. GET EXCITED (because I am!)!! 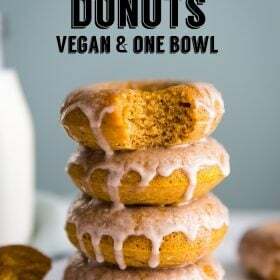 These beautiful little Pumpkin Donuts are vegan, dairy free, and the fluffiest little pockets of goodness that I’ve had in a long time. What is it about donuts that just really makes me feel like I’ve baked something extra fancy!? Or, is that just me? This recipe is very similar to my vegan muffin recipe which means that it’s an easy one bowl recipe. You’re welcome. We’re going to start by sifting together the dry ingredients and then gently mixing the wet ingredients right into the same bowl. To make for an optimally smooth and pretty donut, I put my batter into a baggie, cut off one corner, and then piped the batter into the donut pan. 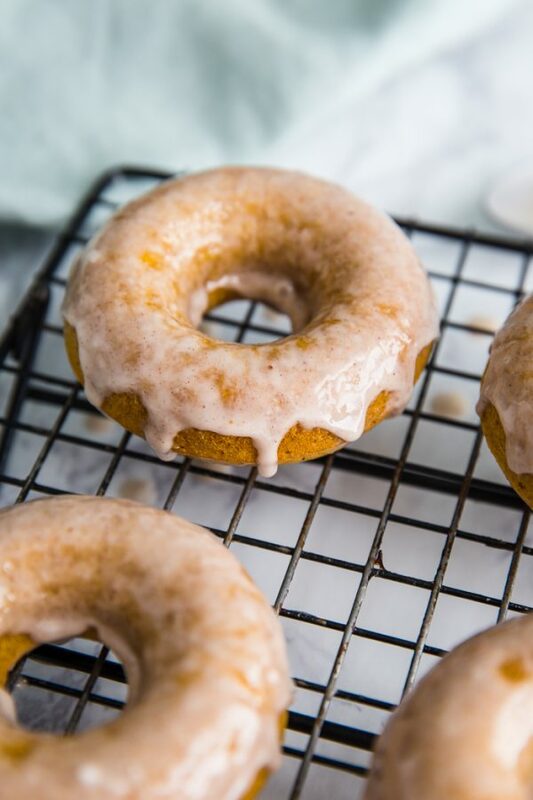 One of my favorite parts about this recipe is that it only takes the donuts TEN quick minutes to bake. As you can see from my photos, I’m incapable of waiting for the donuts to cool down before icing them and then digging in. Speaking of which, I like my icing on the thinner side so that there isn’t too much on the donut and overpowering the pumpkin taste. BUT you can make yours as thick or as thin as you prefer (not that you need my permission, ya know). That’s all I have for you this week! I hope you have a lovely weekend and that the weather is finally starting to cool off for you like it is here in Nashville (it was in the upper 90s ALL week but tomorrow the high is only 76- woohoo!). Pre-heat oven to 350 degrees F. Grease a 6 cavity donut pan. 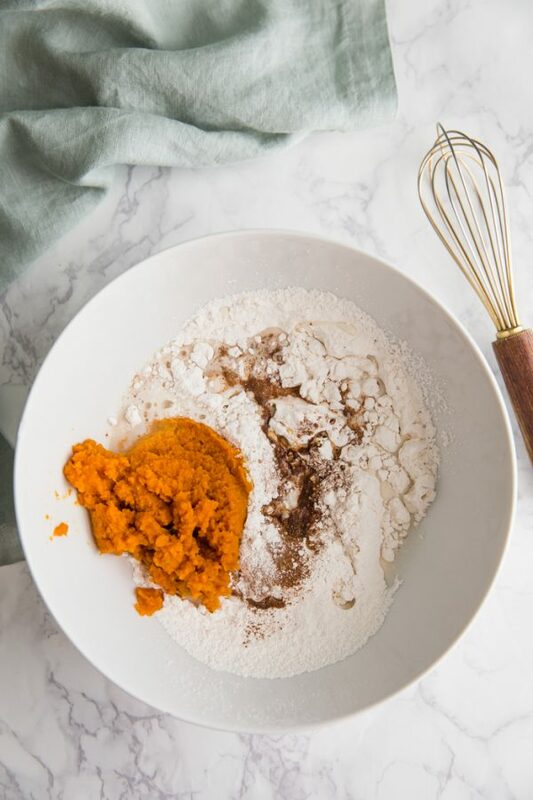 In a large bowl, sift together the flour, baking soda, baking powder, salt, and pumpkin pie spice. 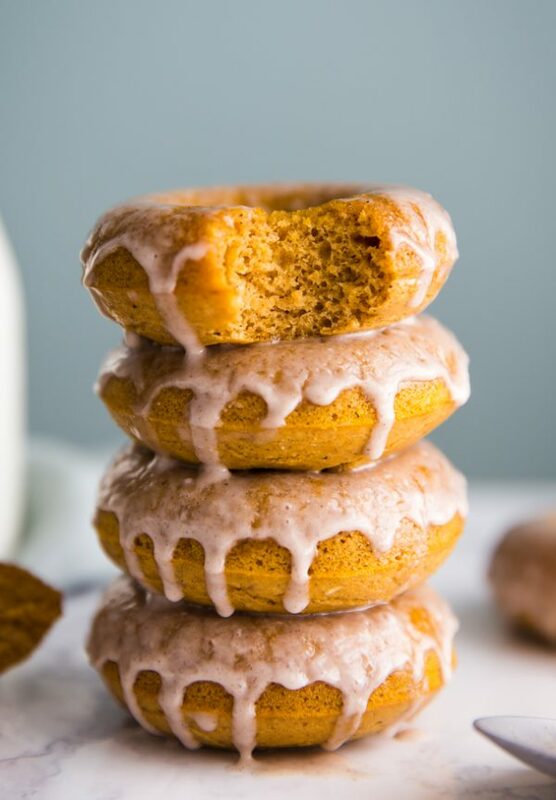 Stir in the milk, maple syrup, vanilla extract, and pumpkin puree. Stir until well combined. Evenly divide the batter into the donut pan. 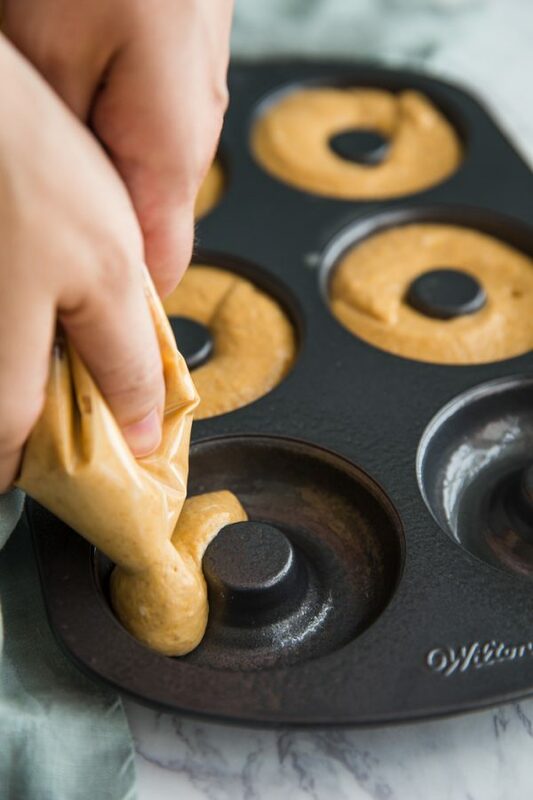 You can spoon it in and shake the pan a bit to level it out OR you can pour the batter into a baggie, cut one corner, and then pipe the batter into the donut pan. Bake for 9-12 minutes or until a toothpick inserted in the donuts comes out clean. Mine took right at 10 minutes. 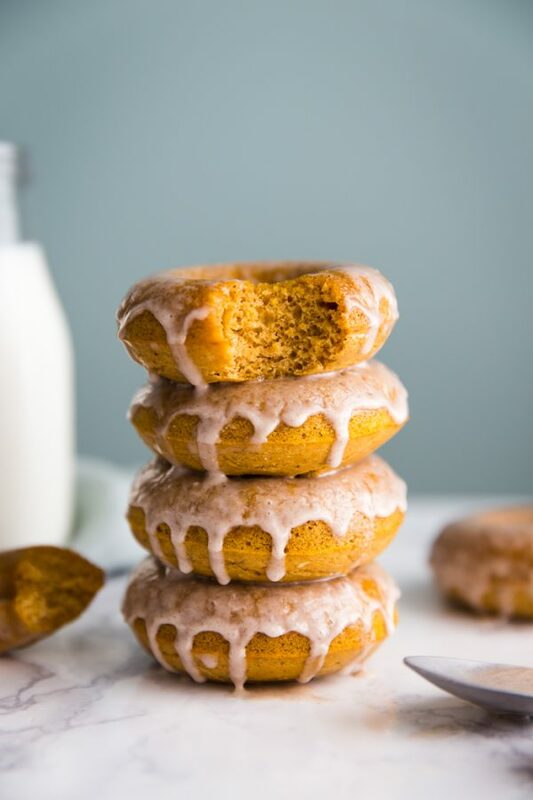 While the donuts cool, make the icing by whisking together the powdered sugar, 2 tablespoons of milk, and 1/2 teaspoon of the pumpkin pie spice. Add additional milk, 1 tablespoon at a time, until you reach your desired icing thickness. Once donuts have cooled a bit, dip them into the icing and ENJOY! Just made a double patch of these, they are amazing! aww yay!! that makes me so happy to hear!!! Hey. 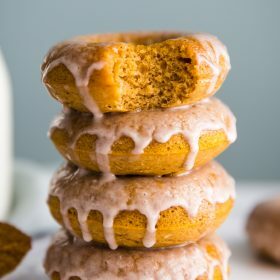 Would replacing the powdered sugar for stevia ruin the donuts’ consistency? Unfortunately I can’t say for sure. I have not done a lot of baking with stevia. Sorry I can’t help more! 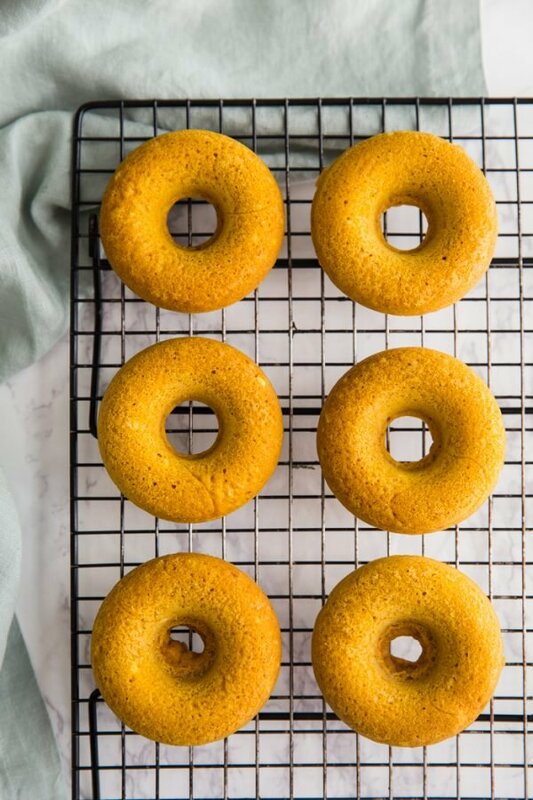 Would it be possible to put these into a shallow muffin pan as I don’t have a donut mold? Is the almond milk supposed to be unsweetened? It doesn’t make a huge difference. I used unflavored and unsweetened.